Successfully Added 150mW Sound Activated Red and Green Double Laser DMX Projector to your Shopping Cart. Unleash this raw power double laser projector with DMX ports. Coming with 10 function switches and 3 mode options that include, sound activation, auto-mode and DMX 512 which is used to control stage lighting and effects via a mixing desk. The G199 is built with an outer aluminum casing, and packed with internal high tech electronic components which also include an N1.8 high precision stepper motor that enables this 3-in-1 laser projector system to emit stunning effects with 2 single Red and Green lasers. The G199 consist of 10 function switches and a DMX 512 IN/OUT port at the back, with upgraded specifications for Volume and MIC controls located in the front. 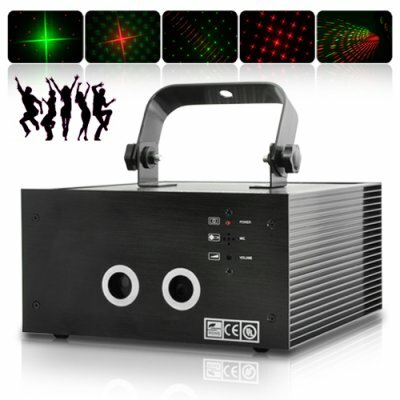 This laser projector is perfect for parties, disco, balls, dances, raves, bars, nightclubs even in your living room for the best chill out "session" while listening to your favorite tunes. To increase the sound sensitivity of the laser projector, just use a star screw driver to adjust the volume control, the MIC will then interpret sounds differently and the cutting-edge internal sensors will display one of dozens of pre-programmed patterns onto an external surface. The two DMX ports located at the rear (DMX in & DMX out) can be connected using DMX cables (not included) to a compatible Digital Multiplexing (DMX) lighting control unit, which allows you to control the laser patters while DJing. This Laser projector can be mounted anywhere that suits your needs, and it is adjustable to easily be aimed at the area you wish to highlight, whether it is the wall, ceiling or floor. The CVLC-G163 is in stock now and available at an incredible factory direct wholesale price from Chinavasion. When using the CVLC-G199 projector, it is recommended to place the projector next to the base unit of your sound system. The MIC on the projector will then pick up the vibrations in the sound wave and start to dazzle everyone with its exciting laser light projections and pattern designs. Yes, this product will work in North America and anywhere else in the world you choose to use it.